A Student of Fair Ability…….. I believe in fairness, decency, and good manners. I will endeavor to retain the spirit of youth. 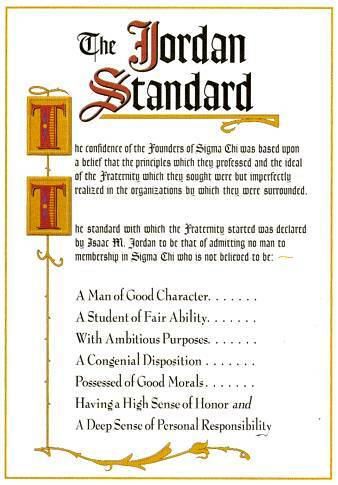 I will try to make my college, the Sigme Chi Fraternity, and my own chapter more honored by all men and women and more beloved and honestly respected by our own brothers. The purpose of this Fraternity shall be to cultivate and maintain the high ideals of friendship, justice, and learning upon which Sigma Chi was founded. 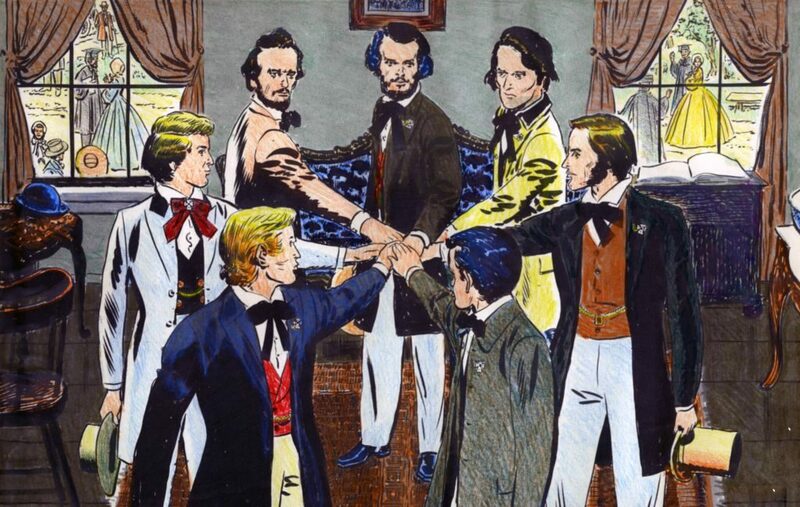 In the fall of 1854 a disagreement arose in Kappa chapter of Delta Kappa Epsilon at Miami University, Oxford, Ohio. This chapter consisted of 12 men. Six of them, led by Whitelaw Reid, supported one of the members for poet in the Erodelphian Literary Society. Four of the other six members, James Parks Caldwell, Isaac M. Jordan , Benjamin Piat Runkle, and Franklin Howard Scobey, refused to vote for the brother because they knew him to lack poetic abilities. They favored another man for that office who was not a Deke. Thomas Cowen Bell and Daniel Wm. Cooper were not members of the Erodelphian, but their relation to the disagreement was unqualified endorsement of the four. Thus, they became six.